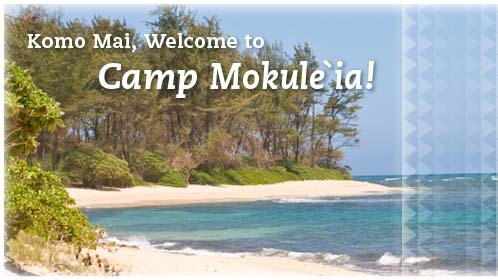 SWAG 2017 (reduced) Camp Mokule`ia Summer Camp: Hui Pū 2016. Hui Pū (the gathering)is for anyone ages 9 –18 years old. The theme this year is “S.W.A.G: Saved With Amazing Grace” focusing on ones identity in Christ …. forgiven, loved and worthy! Expect an amazing camp, experiencing a different face of God with campers your age! If there is any ministry that is great at winning young hearts to God, it would be CAMPING! Camping can be the beginning of something new. An average teen has at least 150 friends both online and in person. These are 150+ friends, teens can encourage, uplift and spread God’s word. Elementary students (Ages 9-­12) will camp from July 02–05, 2017. Middle school students (Ages 13-­14) will camp from July 02–06, 2017. High school students (Ages 15-­18) will camp from July 02–07, 2017. Any questions regarding Hui Pū 2017 please contact our Summer Camp Programs Director, Seini Lino, phone (808) 637-6241.